The photograph on the 3rd January 1911 depicts the Sidney Arms at 131 Sidney street, (landlord William Walker) taken during the famous Siege of Sidney street. 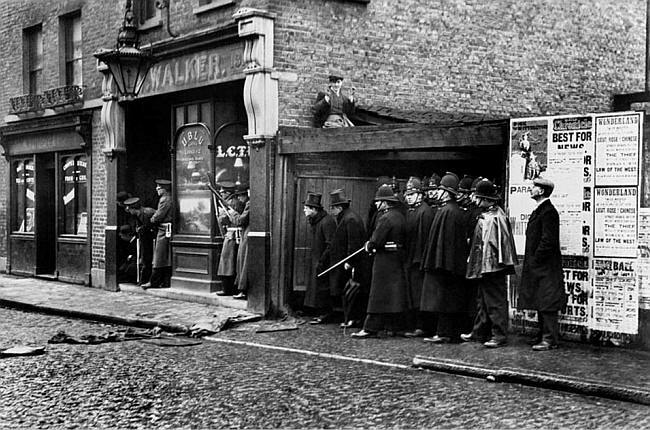 Scots Guards based at the Tower of London were called in to support the police against Latvian anarchists and Home Secretary Winston Churchill visited the scene, (he is the first man in the top hat by the wooden door). The events were filmed by Pathe News and shown in cinemas the next day. Sidney Arms, 131 Sidney Street, Mile End E1 - 3rd January 1911 with landlord William Walker, during the famous Siege of Sidney street.